‘Detski Mir’ is a toy store from the Soviet era. 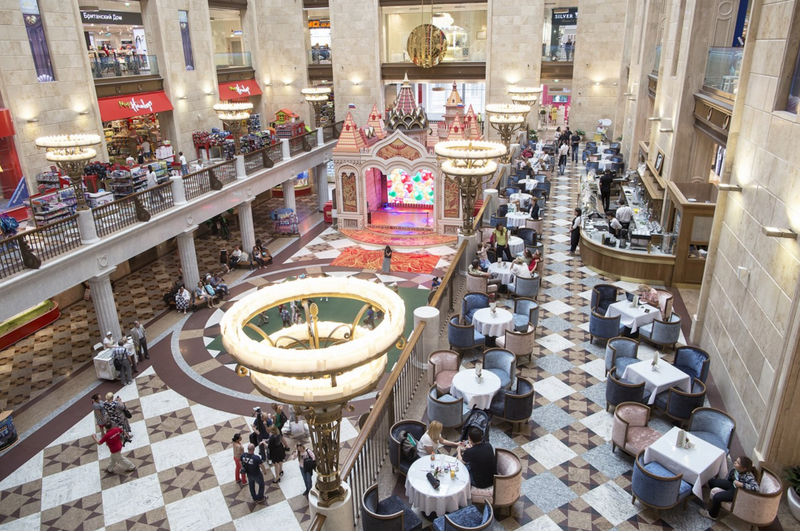 An Indian woman in Moscow writes home about her experiences in the city and the wonders it unfolds, this time through ‘Detski Mir’ or ‘Children’s World shopping mall. It’s a lovely spring morning and Moscow is waking up to the intermittent chirping of birds as they hurry about performing their morning ablutions and knocking at random window panes for food. You see, I have inside knowledge of how their day unfolds as I have a feathered friend of my own who comes and knocks on my window religiously at eight every morning. In return for the grain or legumes that I layout for him on the windowsill, he brings me stories from beyond the clouds. I have always called Moscow a fairytale city. And it’s not just because I cut my teeth on pop–out fairytale books of the Soviet era. Everything about Moscow is beautiful and, to my small frame, appears larger than life. The wide streets, the enormous frescos and resplendent lamps in metro stations, large museums and art galleries, escalators that descend so deep that they could take Alice down the proverbial rabbit hole and, last but not the least, the shopping malls. Talking of shopping malls, I had the pleasure of visiting one such centre of unadulterated childhood delight over the weekend. The store in question is a large building within walking distance from the Kremlin. It’s called ‘Detski Mir’, which translates as ‘Children’s world’. It is a toy store from the Soviet era. The joie de vivre of the setup is inescapable. It has six lavishly appointed floors. The foyer conveys an impression of unmatched grandeur with stunning marble flooring and brass floor lamps preserved to this day from the time of the inception of the store. It houses what is claimed to be the largest lego installation in the world. Given the Rooski preoccupation with the Cosmos, it is no surprise that this installation is in the form of a spacecraft. It is over 18 metres or around 4 floors high, and is composed of 1.9 million lego pieces. The rocket is shown darting through clouds. On it are famous people from various time periods: Pythagoras, the Vikings, Egyptians, Roman legionaries, Guttenberg, and a Dutch astronomer, among others. Most Russians come with children and spend time explaining the characters to them. As always, the erudition of the Russian people stumps me. On a lighter note, to find no unruly children screaming about in a toy store on a spring Sunday is nothing short of delightful to my conservative sensibilities, which have always upheld the “children are meant to be seen, not heard” dictum. The central atrium boasts of 1000 square metres of stained glass ceiling with Ivan Bilibin’s legendary illustrations from Russian fairy tales: tsars and princes and swans and soldiers that rise out of the sea. Craning the neck up to find familiar stories can set your head spinning and transport you to a world of magic and fairies. The atrium also features what is claimed to be the world’s largest mechanical clock. It weighs around 4.5 tons, with a 13 metre long pendulum swinging in the air reminding one of the passage of time even in this magical world of childhood. The clock proudly displays a large tag that says ‘Made in Russia’. The Russians take enormous pride in their technology. The store came into being in 1957 as a government store for children. Those days, it was divided into zones according to age. Kristina, my Russian friend, tells me the store is “bez dushi” or soul-less. But to my uninitiated Indian eye it seemed nothing short of magic. She tells me, that during her childhood it had a different atmosphere. Another Russian friend shares her disappointment and said, after the renovation of the store, it had been reduced to a shopping mall with separate shops. Apparently in his childhood it was one big shop. Another remarkable installation in the store is stained glass panels depicting the Russian map and its national emblem, encrusted with Swarovski crystals. An interactive library, an interactive painting station, a 3D dinosaur show, a beautiful operational carousel, a virtual aquarium, and a ‘journey to mars’ interactive map; there are lots of activities for children and for perfectly serious adults to turn into children. I plead guilty to running up a wooden bridge myself in the ‘Magical forest’ zone, to emerge excitedly on the other side of the corridor. After the day’s excitement, as we sat spent, sipping tea at the ‘Teddy Bar’ and devouring traditional meat and cabbage pies, a mesmerising light and sound show began, for which we seemed to have occupied the Royal box seats. We sat back and allowed the sensations to wash over our tired souls. Thus recharged, we decided to ascend to the top floor for a vantage view of the city. The top floor has, among other attractions, a food court in the central atrium, the stained glass skylight of which depicts Moscow themed paintings of the famous Russian cubist Lentulov’s paintings, setting the mood for the panoramic view of the city from the terrace. Stepping out on the terrace, one finds spotlessly clean glass walls for a delightful view of the Kremlin and surrounding areas. A telescope has been installed here for the viewing pleasure of visitors. The icing on the cake was the Childhood Museum located right next to the exit from the terrace. Displaying over 1000 exponents from a Russian childhood, ranging from books to wooden horses, from mechanized mini football boards to wooden construction sets, from life-like miniature aluminium kitchen sets to carpenter sets that include a small saw, it was all there. These were the early building blocks of the Russian character. Since most were from Soviet times, all around me were middle aged Russians squealing with delight saying, “I had one exactly like this”. Some were explaining to surprised children or grandchildren how a certain toy worked. In a way it saddened me to think how much we in India depend on western toys. My earliest toy that I can remember, alas, was a beautiful large ‘imported’ doll that shed tears and a light as feather bronze kitchen set brought to me from “overseas.” Soviet Russia’s iron curtain perhaps helped them to preserve their material culture better. Not to say that I didn’t have any Indian toys, yet I am doubtful if I could count a thousand toys of Indian origin. Much to my delight, some toys that I saw were common to Indian and Russian children. Apart from the usual construction sets and kitchen sets and wooden ponies, that I believe every child has irrespective of his geographical location, there was a large Russian wooden ‘top’ or ‘lattu’ as we call it. It brought back childhood memories and set me smiling. Setting the ‘lattu’ spinning was an art that took some practice and I remember being rather proud of acquiring the skill. I didn’t see any analogues to the Indian ‘gilli danda’ or ‘kanche’ (glass marbles). The closest to our ‘kanche’ was a set of toffee wrappers, folded to form little cards. These cards were made to jump by striking them against the edge of a table and if the opponent’s card landed on yours, then they got to keep your card. Another toy that tugged at my heartstrings was the little red Russian doll with the large round tummy which cannot be made to lie down. That’s a Soviet toy I had as a toddler. In Russian, it’s called the “nevalyashka”, “girl that does not lie down”, with “ne” meaning not and “valyat” meaning to lie down. I remember trying to put my doll to bed in vain and then deciding that the doll takes after me and does not want to sleep! The cultural ties that India then shared with Russia were to the extent that every Indian child of the eighties has probably played with Russian toys. Our evening came to a spectacular close just as we were leaving the little museum, the lights went off and we were informed by the guard that it was movie time. We decided to watch the ten minute documentary film that outlined the history of ‘Detski Mir’and made ourselves comfortable on the beautiful large pouffes in the centre of the hall. The documentary was made even more interesting by supplementing it with a light show. Right beneath the screen stood a large plaster model of the toy store’s building. The building was illuminated to depict various stages of its construction and passage through the years. It was done with such finesse that I watched in open-mouthed wonder. It made me think how much thought goes into every little detail and how much Russia had to offer to the common man. Needless to say I returned from ‘Detski Mir’ a child myself, and will regurgitate the experience for a long time to come until it finally sinks in. I must sign off now and begin my work day. There is plenty vying for my attention, which I must get done today and then in the evening a trip to the ‘magazin’, the russian word for shop. I plan to buy eggs today. Soon it will be Easter here in Orthodox Russia and just as we do every year, this year too my friends and I plan to colour Easter eggs.